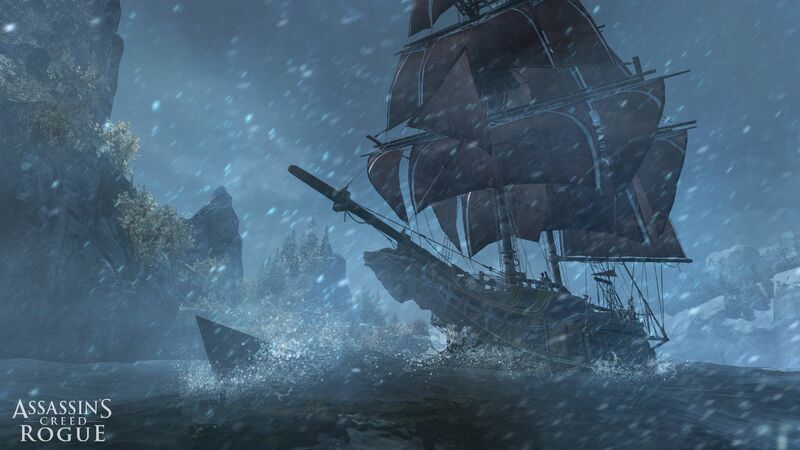 We sink our hidden blades into Assassin's Creed Rogue. How does it feel to turn the tables on the Brotherhood? Our review. Take the gameplay from Assassin's Creed: Black Flag, give it a little tweak for a new time period and location, and feature a protagonist from the shadowy Templar Order. Sounds fantastically straightforward, right? Yet, somehow, Assassin's Creed Rogue manages to mess it up on practically every level. The story features Shay Patrick Cormac, a hot-headed Assassin who, after a mission to procure a First Civilization artifact goes horribly wrong, turns against his brothers by joining the Templar. He then sails the northern Atlantic during the Seven Years' War hunting down the leaders of the North American Brotherhood. His tales should be unique and epic, but it turns out Templars don't do anything much different from Assassins. 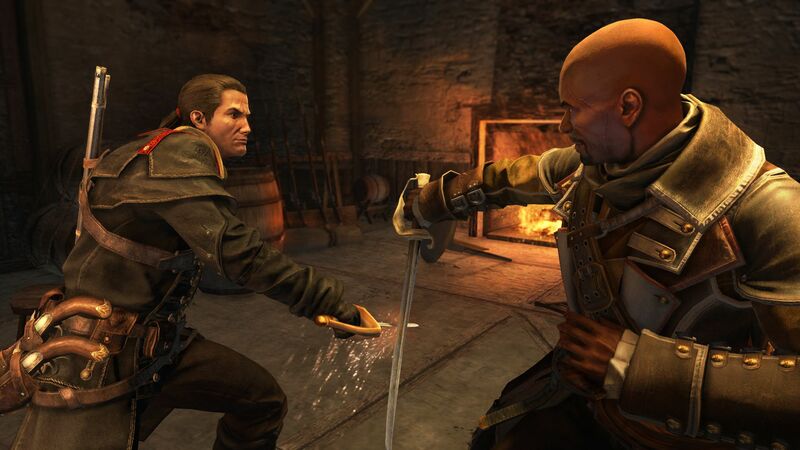 Shay runs around 18th century New York City, taking out criminal gang fortifications and setting up Templar outposts. When he's not doing that, he's sailing the chilly seas, sending French and pirate ships to the bottom of the ocean. All this familiarity might have worked well if every other aspect of the game weren't broken. Rogue marks the end of the Assassin's Creed franchise on the previous generation consoles, but instead of bidding a fond farewell, it's more like a bitter goodbye and good riddance. 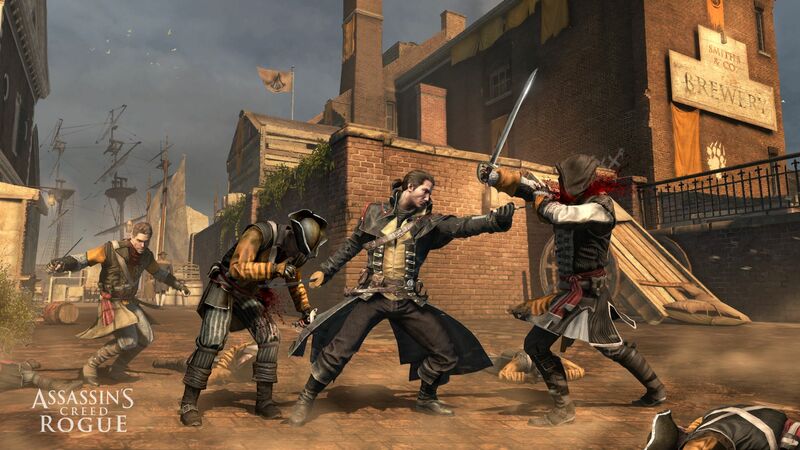 The Xbox 360 and the pre-Unity Assassin's Creed engine both show their age and limitations here, especially if you've played Unity on Xbox One or PS4 consoles or even Black Flag on the PC. This would be an easy thing to forgive if the game weren't completely bug ridden from start to finish. It's never a good sign when, early on, a ship spontaneously sinks for no reason as you sail past it. Or when you leap onto an enemy ship for the first time to take it over and nobody from your crew bothers to join you. During some of the early missions, the prompt to perform a stealth assassination from cover or ledge is faulty. Instead of pulling a target in, Shay actually leaps out from the bushes or climbs up a ledge to stab someone, which alerts everyone nearby. Perhaps this is supposed to demonstrate his inexperience as an Assassin, since the problem doesn't occur in later parts of the game, but it's nonetheless frustrating to be unable pull off simple moves. Drop assassinations are also a problem, since it seems Shay can't perform them from too great of a height. However, you can still highlight targets that you can't kill, which makes it all the more annoying. I can't count the number of times I screamed, "What are you doing?!" at the screen. Then there are times when assassination moves simply fail. Drop assassinations will sometimes fail when the target is only vaguely aware of you. Running assassinations may simply miss, leaving Shay looking like an idiot as he unsheathes his blades, dashes past a target, and then doesn't know what to do with himself as soldiers go into full alert. Free-running is an utter disaster, as Shay will often come to a complete halt instead of leaping to a nearby tree branch or climbing up to the next ledge. That's assuming that he even runs in the direction you want him to, because trying to compensate for these sudden pauses often causes him to go off in some strange direction. Enemies have messed up sight lines, and will often be looking up at rooftops and trees, which completely defeats the point of using them. Once, while moving along a ledge, I leapt between buildings. An enemy on the ground spotted me for a split second between the narrow building gap and went into full alert, signaling his allies to hunt me down. These keen senses aren't limited to Assassins, or even the criminal gangs they ally with. Every type of enemy has eagle eyes. Therefore, there's little point in playing stealthily. Might as well just get a head count of soldiers, get rid of the snipers, then kill everyone in an open sword fight so you can finish your mission. Then comes the part of fighting the Master Assassins, which by all respects, should be grand, epic and (in a sense) heartbreaking, especially when confronting known characters like Adewale. Nope, it's actually just a big joke. All but a couple of Master Assassin encounters can be resolved in a few seconds by tapping the button to quickly fire your pistol at them. Some of the others take a little longer because you have to chase them down to shoot them. The one bright spot comes from the sea battles, which is largely lifted from Black Flag, except enhanced with icebergs. Although destroying small icebergs with your cannons and watching them collapse into the water is impressive, the frozen wastes of the Northern Atlantic and its narrow channels takes a lot of the joy out of sailing and exploration. The icy sea will damage Cormac if he swims in it for too long, which (when combined with the terrible free-running) discourages exploration. I hated trying to figure out a platforming puzzle, falling into the water, and having my screen freeze over with white as I desperately tried to get back on land. Whale hunting is enhanced to include small icebergs that damage your boat as the whale drags you across it. It makes the mode significantly harder, and discourages further tries. Similar to Black Flag, Rogue has a notoriety meter that fills when you attack enemy ships, but it slowly decays as long you stay out of combat. Defeating a ship creates an alert radius, and ships passing through it will automatically be on the lookout for you. However, waterways tend to be so narrow that ships can't help spotting your sea battle, and that's when things get kind of comical. Thanks to a new weapon called a Puckle Gun, essentially an autocannon, you can demonstrate how embarrassingly bad the 18th century French fleet was by sinking ship after ship until there's nothing left, not even bounty hunters. It only takes a few upgrades to become a greater scourge of the seas than any pirate from Black Flag. 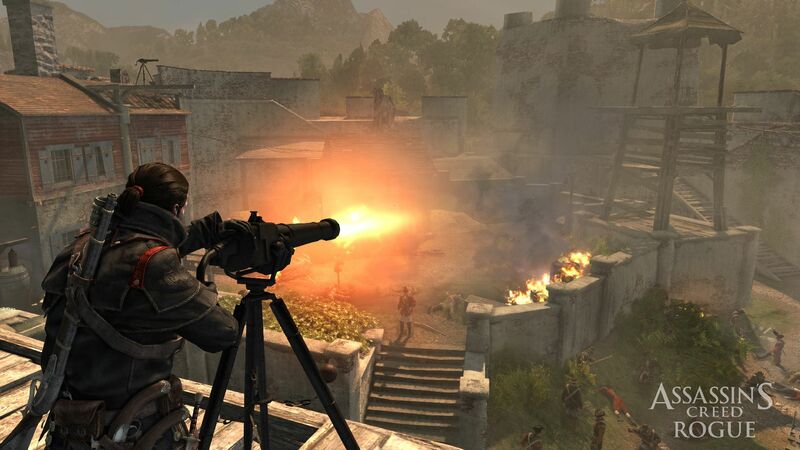 Rogue brings back the investment and banking system from Assassin's Creed II, where renovating landmarks and clearing out enemy encampments brings in money that is deposited periodically. Although I was very pleased to see its return, the system pretty much makes every other source of revenue obsolete. There's no reason build up a fleet a ships and conduct naval missions anymore (which in itself is a watered down version of Black Flag's), search for hidden crates, or gamble at a tavern. All I had to do was clear out the gang hideouts and renovate a few buildings before, true to the Templar fashion, I soon ended up with more money than I knew what to do with. With it, I purchased the best gear and animal skins so that I could craft gear without having to go hunting. Unfortunately, you still can't buy raw materials like wood, cloth and metal from stores--something that only makes sense in the Assassin's Creed universe--otherwise I would have also had a fully upgraded ship in short time. One feature that makes Rogue unique are Stalkers. This enemy type, like Assassins, hide and lie in wait until Shay passes by. Then they strike for high damage before running off. To combat this threat, Shay has a sort of danger sense that alerts him whenever a Stalker is nearby so that he may seek them out and kill them first. While this might sound like a great innovation, it actually brings the gameplay to a halt. Stopping mid step while running down city streets or over tree branches to play "find the Stalker" breaks what little fluidity Rogue has going for it. However, I will admit that it's fun to shoot a stalker with a Berserk Dart and watch them one-shot kill nearby soldiers. About the only thing that I genuinely enjoyed about playing Rogue is the modern day sequences, where you're granted access to Abstergo's files for a look into Templar missions and their mentality. I'm still unsure what's so appealing about a world that's kept in ruthless order, but it's fascinating to learn about Templar goings on and how there's a modern day Assassin hunting squad called Sigma Team. Apart from an annoying lady that keeps referring to you as "numbskull," the modern day segments might be one of the best parts of the game. Other than that, the story can be quite silly. Shay's conscience is torn up because he doesn't believe anyone deserves to have the power to destroy whole cities, and possibly the world, but he's more than willing to hand it over to the Templars. Not to mention, he spends the whole time protecting a book, and keeping it out of Assassin hands. So, the whole affair could have been avoided if he just burned it. Shay comes off as a bit bratty when he's sent to kill Templar Grandmasters that were old and had one foot in the grave anyway. He also says, "I make my own luck" so many times that you just want to slap him. He's not the only one, either. His quartermaster, Christopher Gist, has a voice that sounds so pompous that it almost makes me regret rescuing him. As rising through the ranks of the Templar Order, it's not anything to write home about. As stated previously, Templars don't do anything that Assassins haven't been done in previous Assassin's Creed games. A few things are turned around, like how bounty assassinations are interception missions, where you have to stop an Assassin from killing his target. Templars are also allied with the British, which doesn't amount to much, since British soldiers don't recognize you as an ally. They will roughly shove you aside if you stand in their way, and they'll show up as enemies on the minimap. I once tried to rescue a couple of British POWs from a French encampment, but targeting is so unreliable that I ended up drop assassinating the prisoners instead of the captors. I disliked Assassin's Creed Rogue on almost every level, from its numerous game-breaking bugs, to its terrible free-running, and (worst of all) its ruined assassination system. Not even the plot, which fills in the gap between Black Flag and Assassin's Creed 3 while recounting the fall of the North American Brotherhood, is very satisfying. I started this game wanting to become a Templar believer, and I left shaking my head in disbelief. This review is based on a Xbox 360 retail edition provided by the publisher. Assassin's Creed Rogue is available in retail stores now for $59.99. The game is rated M.
Some insight on the Templar Order. Ties into Black Flag, Assassin's Creed 3, and Unity. Lots of game-breaking bugs from start to finish. Broken free-running and assassination gameplay. Renovation system makes everything else obsolete. Enemies have crazy lines of sight. Master Assassin encounters are a joke. Stalkers bring the gameplay to a halt. Game discourages exploring and doing side activities. Story doesn't make a lot of sense. Wow. Black Flag was excellent and then they turn out Unity and this. The D team, is that a shacknews team? Damn. Ubisoft AC teams are probably dog tired. The franchise probably needs a bit of a rest. wow, did not see this coming. He was working on that 1666 game or whatever, but he got acquired by ubisoft and fired lol. How well would this game stack if they fixed the bugs?